Volgograd Arena joins the list of stadiums with very high expected operating cost. Exact budget for annual maintenance isn't available as of now, however official estimates aren't optimistic. “Today we can say that the estimated operation after the World Cup will run into RUB 250-300 million ($4 – 4.75m). 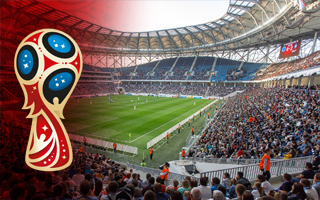 It's hard to give a more precise number because the stadium was only opened in spring and is yet to run a full cycle.” said head of the local organising committee Arkadiy Grushko. For now the stadium is owned and operated by Russia's federal government, through the purpose-created Sport Engineering (Sport In) subsidiary. Most likely in 2019 it will be transferred to the Volgograd Oblast (regional authority), just like other Sport In venues in other regions. Already now a plan is being worked on, which will see the World Cup stadiums subsidised by the government even after the transfer. It's not yet clear, whether it would run for 3, 5 or more years, but the goal is to enable safe transition from tournament mode to regular operation, including commercialisation and with it a stable financial framework. The 45,000-seater in Volgograd is fortunate in a way, because it will host a strong traditional football club, FK Rotor. In recent years its results haven't been encouraging, with average attendance falling below 1,000 per game in 2015, however the period of Volgograd Arena's construction forced Rotor to relocate. With poor performances on the field in the second league Rotor drew 3,620 people on average in 2017/18. First two games played at the new stadium, despite having capacity cut significantly, had average turnout of over 20,000, which would be a fantastic average to build upon, if sustained throughout a season. It's now understood the regional authorities plan to downsize the stadium in the future, but at the same time it was revealed that there has been no legacy planing in place. As of now we do not know how much and by what means the stadium will lose some of its capacity. It may fall to 36,000 or 40,000 in the long term, but this is only now being considered.